Official Photos Of The Nike Air Foamposite Pro "Gucci"
The Nike Air Foamposite Pro "Gucci" releases in just a few days. As most of you may know, Gucci is notorious for their red/green design. This colorway of the Nike Air Foamposite Pro doesn't officially callout Gucci for the inspiration, but it's clear to see the impact the brand had on this design. Officially dubbed the "Gorge Green" colorway, this Nike Air Foamposite Pro will be available this Friday. 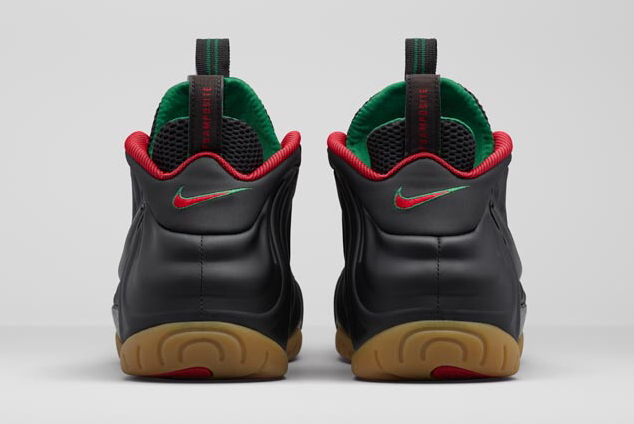 The Nike Air Foamposite Pro "Gucci" is mostly covered in a black shell with red/green on the upper lining. A gum outsole plays at the finishing touch complimenting the sneaker's overall appearance. Retailing for $250, let us know if you plan on scooping a pair later this week.